You WANT to go into the creepy abandoned castle?! When last we left the stalwart heroes of Warhammer: End Times - Vermintide, everything was awful. It's not like the Warhammer universe is exactly brimming with hope, but current events blew the hinges off of the "How Terrible Is This?" Meter. The ravenous Skaven have taken the city of Ubersreik as you and your three co-op buddies flee the apocalyptic invasion. Not that it really matters all that much because the world is ending. That's like finding out your car was the victim of a piano tumbling out of a 18th story high rise suite, only to look up in time to see the sun explode. Where does one run from an unstoppable wave of frothing man-rats? The Grey Mountains of course! 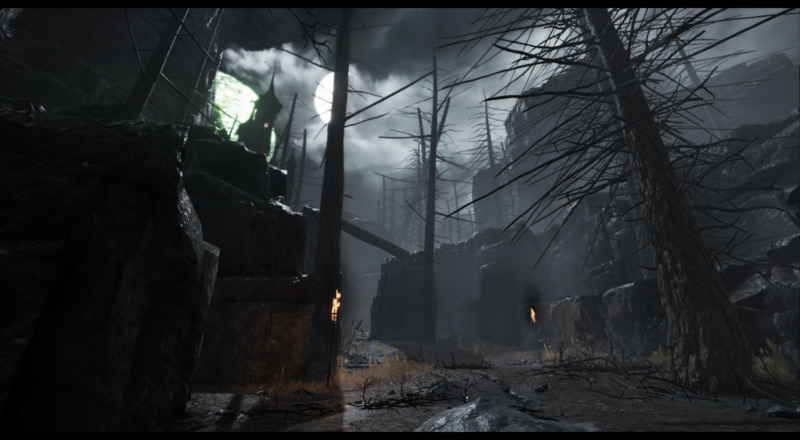 Finally, you and your pals can ditch the now infested streets of Ubersreik and seek refuge in some gorgeous environments in the new "Dranchenfels" Update for Vermintide, available for $8.99 on Steam. "Drachenfels" includes three new adventure maps, Castle Drachenfels, "The Dungeons," and Summoner's Peak, all of which feature different environments and some crazy mechanics. You can also snag two new weapons with "Drachenfels," being the two-handed Glaive for Kerillian (the Waywatcher), and the Volley Crossbow for Saltzpyre the Witchhunter. In a beautifully magnanimous gesture, developer Fatshark has enabled co-op play on the DLC maps even if not all the players have the update. Instead, select one of your usual co-op crew (straws, lottery, whatever your preferred method of random punishment) to soak the $8.99 purchase and host the game. That's it! All four of you can play the harrowing continuation to Vermintide, even if only one person owns the actual DLC. Vermintide was our favorite co-op game of last year, and continues to be an excellent game to hop in and slaughter a few rats with.